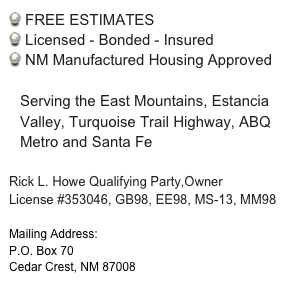 Turquoise Trail Electric, Plumbing, & Water Our locally owned & operated business has been serving both residential & commercial clients since 1986. We are approaching our 30th year of providing quality workmanship & services through longevity in relationships, integrity & dependability. We have remained in business when most other companies sadly have not stood the tests of time and a tough economy. And for that we are extremely grateful to you, all of our loyal customers! Serving the East Mountains, Estancia Valley, Turquoise Trail Highway, ABQ Metro and Santa Fe. Our locally owned & operated business has been serving both residential & commercial clients since 1986. We are approaching our 30th year of providing quality workmanship & services through longevity in relationships, integrity & dependability. We have remained in business when most other companies sadly have not stood the tests of time and a tough economy. And for that we are extremely grateful to you, all of our loyal customers! Serving the East Mountains, Estancia Valley, Turquoise Trail Highway, ABQ Metro and Santa Fe. Thank you for considering Turquoise Trail Electric & Plumbing, LLC for all of your electrical, plumbing & water solution needs. Our locally owned & operated business has been serving both residential & commercial clients since 1986. We are approaching our 30th year of providing quality workmanship & services through longevity in relationships, integrity & dependability. We have remained in business when most other companies sadly have not stood the tests of time and a tough economy. And for that we are extremely grateful to you, all of our loyal customers!